Finding blood in your urine can be unsettling. If you see blood in your urine, call our team at Urology Care P.C. for an evaluation. We’ll help rule out any major health concerns to give you peace of mind and confidence in your overall health. When an underlying cause is identified, we will determine an appropriate treatment plan. Hematuria is characterized by the presence of blood in the urine. Blood in your urine can be a sign of a serious medical condition; therefore, it should not be ignored. If you have hematuria, one of our board-certified providers will evaluate you and, if necessary, order tests to confirm the underlying cause. Since hematuria is a symptom as opposed to a condition, there is no specific treatment for it. Instead, your provider will treat the underlying cause if one can be found. If there is blood in urine, the symptom can be obvious. Instead of its normal pale yellow color, your urine may be pink, red, brownish-red, or tea-colored. 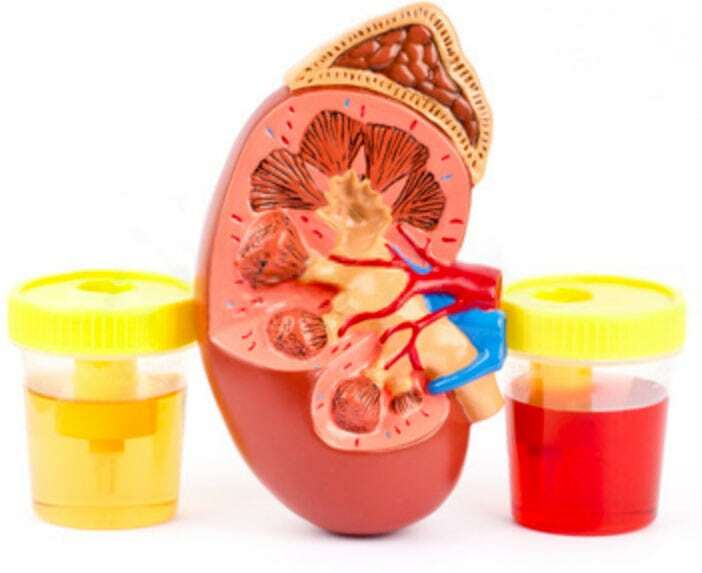 Providers call the obvious presence of blood in the urine gross hematuria, but hematuria may occur without any other symptoms. Sometimes, however, blood in your urine is not visible to the naked eye, and the presence of red blood cells can only be detected by the lab. This is called microscopic hematuria. Bladder infections (acute cystitis): Bladder infections usually cause burning or pain with urination. Kidney infections (pyelonephritis): The symptoms of kidney infections may include fever, chills, and back pain. Kidney stones: Should you have kidney stones, you may experience severe back or abdominal pain. Kidney diseases: Symptoms of kidney diseases may include weakness, high blood pressure, and body swelling. In some cases, what appears to be blood in the urine is actually red pigment from other sources such as food dyes, medications, or an excessive amount of beets. Your provider will discuss your history and do a complete physical examination including a pelvic or prostate exam. Your provider will need a urine sample to analyze for evidence of infection and determine the extent of blood in your urine. You will likely be prescribed a test called urinalysis wherein a sample of your urine is analyzed. Microscopic hematuria is usually only discovered when a urine sample is tested. Urine cytology, an additional urine test that uses a microscope to look for abnormal cells in the urine, may be ordered. Kidney ultrasound: An ultrasound uses sound waves to create a picture of the kidney’s structure. Cystoscopy: This test involves the insertion of a small scope with a camera into the bladder through the urethra. This is typically an office procedure. Even if the CT/IVP does not reveal bladder abnormalities, it is not a sensitive enough scan to rule out small bladder tumors or abnormalities. Therefore, a cystoscopy is always indicated. Tissue samples may be obtained to check for the presence of abnormal or cancerous cells. if you find blood in your urine, come and see our team of board-certified providers at Urology Care P.C. for an examination and a personalized comprehensive treatment plan.